Enjoy a free guided tour around Dovecot’s current Viewing Balcony exhibition, BATHS TO BOBBINS 10 years at Infirmary Street. Delve into the curatorial themes presented in the displays and discover more about some of the works featured, including the processes and materials used to make them. Dovecot was originally located at the site of the Corstorphine Castle, before moving in 2008 to Infirmary Street following a 2 year renovation and restoration project of the former Victorian baths building. Celebrating 10 years of weaving in the Infirmary Street Baths, Dovecot will share some memories on the Tapestry Studio Viewing Balcony. 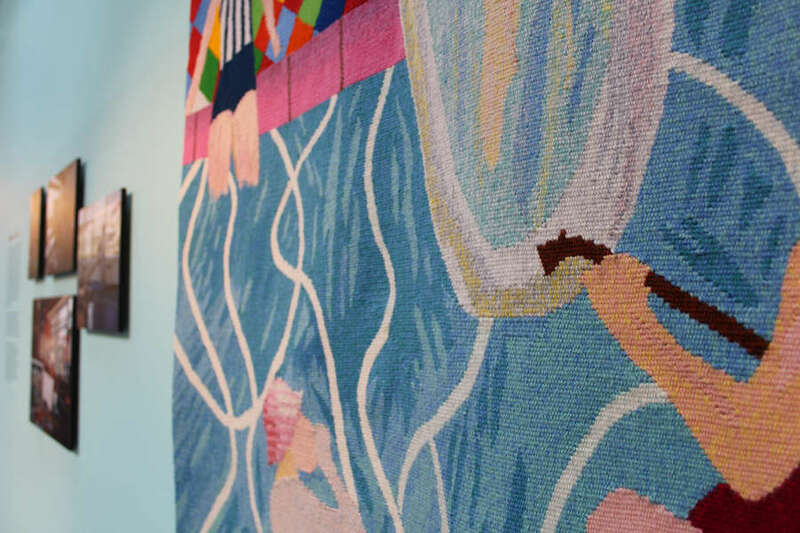 The display titled Baths to Bobbins will explore memories of those who attended the Baths, the stories of the old Studio in Corstorphine, the saving of the Infirmary Street building and its conversion to a modern tapestry studio. Please allow up to half an hour for the tour, including the opportunity to ask questions.